Bromelain is a natural source of protease enzymes, a unique enzyme that helps “digest” non needed protein structures such as inflamed tissue and scar tissue. Inflammation itself is a necessary function of the body bringing white blood cells and fibrin (scar tissue for repair) to the site of an injury for repair purposes. Once the injury is healed the body removes the excess debris naturally. However when inflammation becomes chronic as it is in IC, the build up of fibrin results in excessive scar tissue, reduced bladder capacity, chronic edema (swelling) with pain and inflammation spreading to other parts of the body. Bromelain, as an extract from pineapple stem, has been shown in many clinical studies to reduce inflammation and reduce or prevent the formation of scar tissue. Quercetin is a member of the flavonoid family, a diverse group of therapeutically active compounds found throughout the plant kingdom. There are many natural food sources of quercetin including onions, citrus fruits, black tea, broccoli and red apples just to name a few. 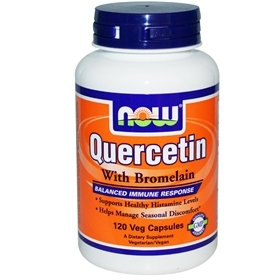 The varied therapeutic benefits of quercetin include strengthening collagen, improving health of capillaries, strengthening connective tissue and reducing the production of various inflammatory agents. Suggested Usage: As a dietary supplement, take 2 Vcaps® 20 minutes before meals, 2-3 times daily. Persons with sensitive stomachs may take capsules with meals. Consider taking this product in combination with NOW® Vitamin C.